Simple neighborhood ristorante has good vegetable antipasti with some nice variations from the usual like cabbage. 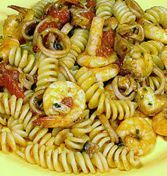 Alfio’s Mom weekly ships her homemade fusilli pasta from Calabria, good served with tomato, mozzarella, fresh basil and pepperoncino. Grilled fish or meat are staples in this Pantheon joint.